There are currently 9,841 users on this website. Has anyone seen this silver proof set before? 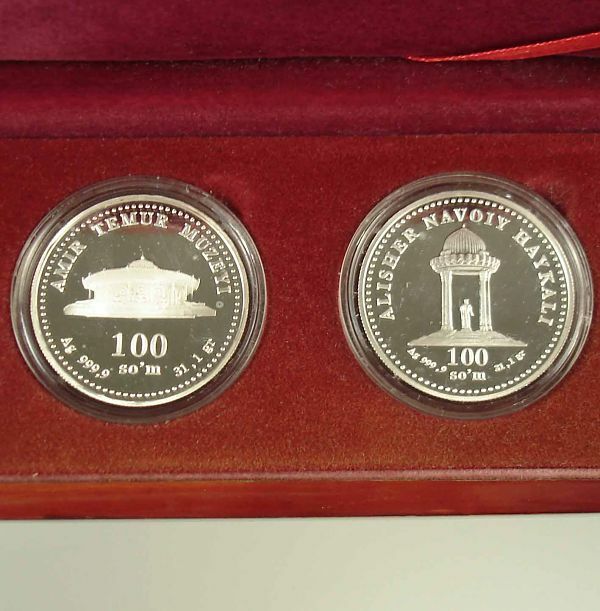 The set includes 4 silver 100 som coins from the country of Uzbekistan. Each coin weighs 1 oz (31 g) and is made of .999 silver. The diameter of each coin is approximately 1 1/2". The obverse of the coins feature 4 different images: Amir Temur monument, Oliy Majlis (Parliment), Amir Temur museum, and the Alisher Navoi monument. 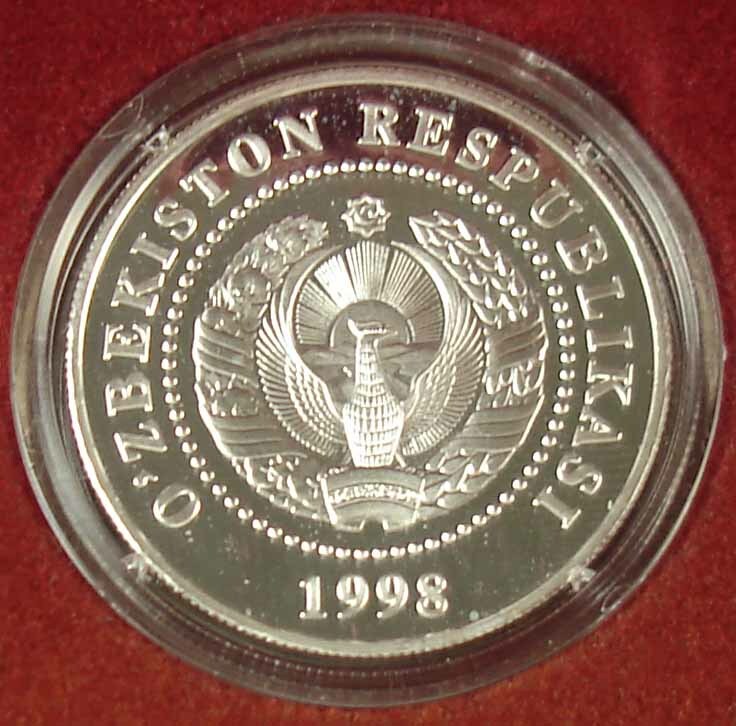 The reverse side on all the coins is the same and has the National Arms eagle symbol with the date 1998. 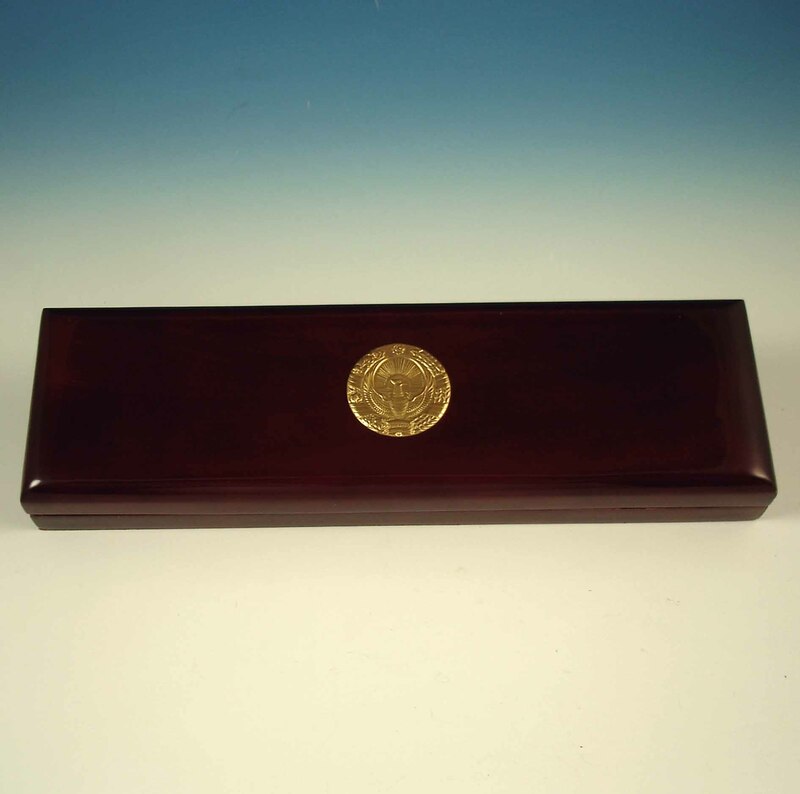 The coins are set in a nice wooden presentation box. Inside the box is a business card for the President, Islam A. Karimov. I aquired the set from the estate of a deceased former agent of the U.S. Diplomatic Security Service. It appears that the set was a gift from President Karimov, but I don't know that for certain. I can't find these coins in the world coin catalogs anywhere. 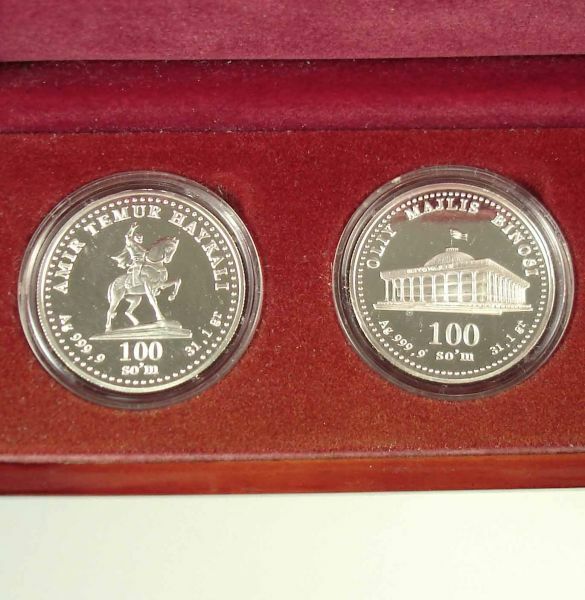 A very similar set was produced in 2001 with a mintage of 1,000. Does anyone know anything about this set, particularly what the mintage may have been? Value? Wowzer - quite a neat set when it comes like this. Some information can be found on Central Bank of Uzbekistan but it's incomplete at best. Does the certificate or the box mention what mint the coins were struck at? It is indeed rather scarce and I think historically it would have been closer to 200 dollars per coin. Please don't quote me on that as I could be wrong. Thanks gxseries. There is no mention of the location where the coins were minted. The card does say that "the coins are made of 999,9 (24 carat) silver extracted in Uzbekistan". It appears this set was given to the Diplomatic Security agent as a gift from President Karimov's office (his business card was inside the box). 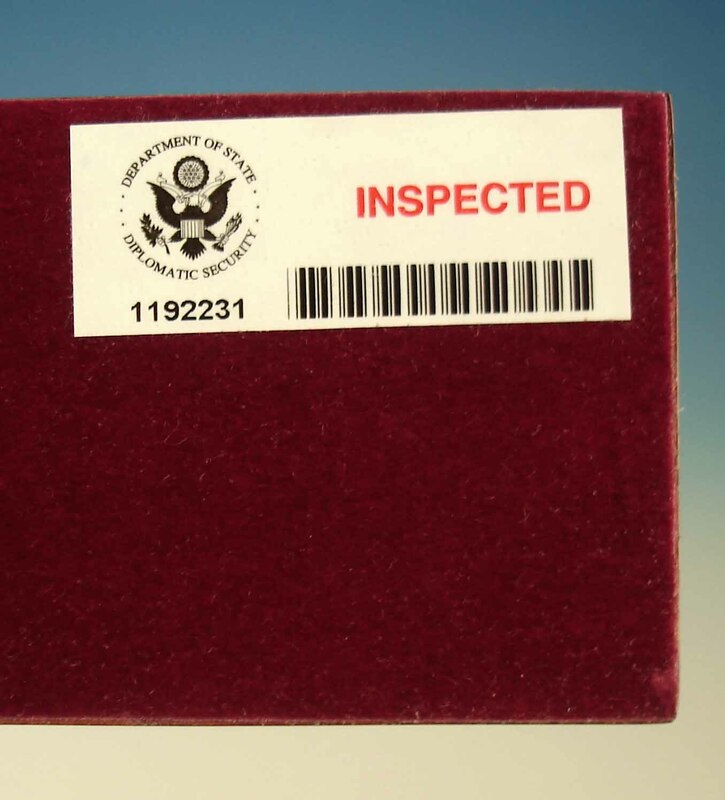 For additional information, I'm also including a photo of the presentation box closed, as well as a label underneath that shows it was inspected by the Bureau of Diplomatic Security. If anybody else has information about these coins, I sure would like to hear from you. I would really like to know how many were minted and how many of these sets might exist. Definitely very interesting quailman - you should hold onto this set for a while. Definitely not common. Let me know if you are going to let it go because this does spark my interest. I did a bit of research and it seems Uzbekistan does have its own mint but there's no website available or more details about it. Some local coinage were contracted out to Pobjoy Mint but this does not seem to be one of them as Pobjoy mint would have a habit of putting their mintmark on it, which is PM. I think it is good to assume that the mintage would be under 1,000 right now. Will do a bit of research later in the day when I get around to it. I spoke too early and I am excited to find their official homepage! Thanks again gxseries. Are you able to read the web site in English? I can't translate what is coming up on my screen. I appreciate your help! If you browse on Google Chrome it usually asks you whether you want foreign language sites to be translated for you. There's not much info there, though. "Commemorative Coins", you can see the (image) list of the commems, which includes yours, but there's no mintage figures. Nice coins, by the way, I'm jealous (I grew up in Uzbekistan). I just read that article, and as svslav said, theres not much info to be found there. (I read it in Russian) Good luck on your quest for more info! Hello Again Folks. I got sidetracked, but I'm back on the information hunt again. I just sent an e-mail to the contact from the Central Bank of Uzbekistan requesting additional information about this interesting coin set. Hopefully, I'll get a reply and I can post the new information. Thanks for everyone's help! Sorry to say that I've received no reply to my e-mail sent to the Uzbekistan Bank. I've decided to go ahead and sell the commemorative coin set. If you're interested, it's now listed on e-bay. The item number is 271056239049 or you can simply search with the keywords "Uzbekistan", "1998", and "Coin". Thanks again for all the ideas and assistance I received. I'm in a similar position. 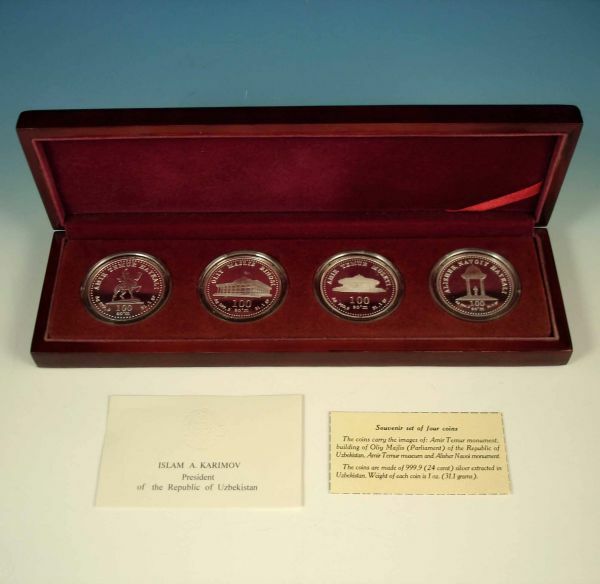 My dad has a similar set, but his is a set of 16 coins witht he same card from Pres. Karimov. It was one of the many gifts he received from Pres. Karimov when he met with the President in Tashkent back in 2003. My dad has it on display at their house, but has no idea what their actual value is. I've searched on eBay, but unfortunatly that has been the best way for me to get a sense of the value for each individual coin, if someone has one they are selling. Where could I send my dads set to have it appraised? Wow, that was a long time ago. I checked my records and my set sold for $700 back in 2012.
quailman, thanks for the info. $700 six years ago, huh? Great price for back then. That means I might be able to get a nice price for mine today.